Edward Miller constantly strove to improve the designs of his lamps. A major area that underwent the most change was the method of controlling the wick in his central draught lamps. The central draught lamp posed a number of unique difficulties that the ‘flat wick’ lamp did not. Miller made his lamps under five major patents which he branded. The first 'The Juno Lamp' is almost identical to the Rochester lamps he was making under license. A second 'Juno Lamp' was released, apparently around c. 1892. It seems around 1895 this version was used to create the 'Home Lamp' in the #0 size. ‘The Miller Lamp’ (c.1892), and a third ‘The Juno Lamp’ (c. 1895), then ‘The New Juno Lamp’ (c.1898). Finally Miller was able to incorparate a 'thumb wheel' into his lamps with the ‘The New Vestal’ (c.1902) and finally 'The Ideal' burner was released around c. 1916 - 18?. The basis of each patent design was the wick raising devise and wick carriage. Other types of Miller lamps exist, such as 'The Empress'(c.1899), 'The Non Explosive Lamp' (c. 1900?, 'The Mill Lamp' (c. ???? ), Factory Lamp (c. 1900), Gaskell Lamp (1900?) however these are variations of one or maor eof these patents, typically his c. 1895 'Juno' patent. A table showing the various sizes that each Miller patent and brands are known to have been made. + - Released around 1895? branded 'The Home Lamp' and ONLY as a #0 sized hand lamp. 'The Juno Lamp’ – c. 1892? There exists four distinct types of 'The Juno Lamp'. This, the first, is very similar in style and form to the 'Rochester' lamps that Miller made under contract up until 1892. These early 'Juno' lamps have an older style embossed lettering of the words 'The Juno Lamp' and is distictly different to the 1895 Juno lamp and more than likely pre-dates his famous patents of June 1892. The smaller photograph shows a 'Rochester' made by Miller, for comparison. This 'Juno Lamp' is characterised by the curved wick raising pull and support mounting attached to the collar. The wick carriage is also very different with the pull 'hinged' to it accomodating the changing angle of the arm as it is raised. Again, very similar to that found on 'Rochester' lamps. This lamp is only known with bayonet collars and burners. 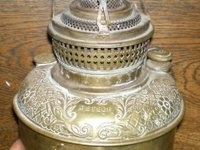 A Rochester lamp showing similarity of wick raising pull and embossing. 'The Juno Lamp’ (second version) – c. 1892? The second of the 'Juno' lamps is identified by the straighter raising pull and the removal of the support mounting from around the collar. These retain the older style embossed lettering of the words 'The Juno Lamp' which is typically found just under the collar of the fount but 'Made in USA' is in raised lettering, rather than stamped as in the first version. It is likely that this style was released very close to his more famous 'Miller Lamp' as the straighter raising pull incorporates the same wick carriage as is used on his June 1892 patents and were made in two sizes. The wick raiser still has no thumb wheel, and the removal of the support mounting allowed for Miller's collar mounted 10" folding tripod shade holder to be easily fitted to the lamp. The No. 2 table lamps are only made with bayonet collars and burners, but 'Tiny #0' lamps are known in both bayonet and screw thread and some are inscribed 'The Tiny Miller Made in the USA'. 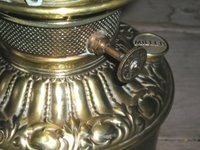 A hand lamp branded 'The Home Lamp' was also made using this raising pull, aparently around 1895. It seems likely that those lamps with a screw thread collar were made post c. 1895. An ingenious devise albeit somewhat complicated to manufacture. The ‘barley twist’ shaft is made up of many moving parts which cause the ‘arm’ to rise and fall as the external wheel is turned. This allowed for accurate wick adjustment (thus flame height and brightness) and overcame the problem of the wick 'slipping' whilst in use. Inside the lamp the wick is fitted over the outside of the carriage and is in the same design as the previous 'Juno - 2nd version'. The patent date is typically inscribed around the thumbwheel of the raiser (raisers with the patent date missing are known) and they were made in three sizes, small (Tiny and #0 lamps), standard (#1 & #2 lamps) and a large version that was inverted for the Mammoth #3 lamp. These lamps all have the embossed lettering 'The Miller Lamp Made in the USA' either just under the collar of the lamp, or incorporated into the embossed pattern (typically on removable founts). Known with both bayonet and screw-threaded collars, it is likely that those lamps with screw-threaded collars were made after c. 1895. An improvement on his early Juno lamps in that the wick pull is a much simpler devise that no doubt was much cheaper to manufacture than the Barley Twist c. 1982 wick pull. Embossed 'The Juno Lamp Made in the USA' , adjustment was now easier with the raising pull being assisted by the geared thumb wheel. This both overcome slippage that the early versions encountered and allowed for better wick control and easier adjustment. Inside the lamp the wick remained over the outside of the carriage and the carriage was unchanged from his June 1892 patents. The patent date is inscribed around the thumb wheel and exists in only the one standard size for #1 and #2 lamps. This patent also saw the introduction of the screw- threaded collar and burner. 'The New Juno' lamp' – c. 1898? 'The New Juno' lamp seems to have appeared from the production lines of Miller's factory around 1898 and represents only very minor changes in design and style to that of the c.1895 'Juno' lamps. The lamps marked 'The New Juno' tend to be of the 'Edwardian' style and are simpler in style and appearance than those holding the 1895 patent. It would also appear likely that the addition of the word 'New' was to differentiate his c.1895 patents from the much earlier c. 1892 'Juno' lamps. Basically, 'New Juno' lamps have the same wick raising assembly as its c.1895 patented cousin and are known with both bayonet and screw-threaded collars. 'The Empress' lamp was introduced with a unique pattern of embossing and is only known in the #2 size and is embossed around the lamps collar 'The Empress No. 2 Made in the USA'. Using the basic c. 1895 Juno patents this lamp differs significantly from its cousins in the design of the chimney mounting (a 'crown' rather than four prongs) and a 'self extinguishing' device which involved a system where the wick lifted and lowered an altered flame spreader which was fitted with an arm and guide. A scarce lamp which seems to have been a 'better end' lamp and thus a more expensive table or hanging lamp. Typically found with bayonet collar and burners. It is believed that this lamp was only sold as nickel plated, thus making brass versions that exist today restored lamps that have had a worn nickel plating removed. Versions in a removable fount for vase or banquet lamps embossed 'The Juno Lamp' are known. There is much debate and discussion regarding 'The Meteor Lamp' . 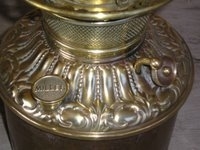 There is no doubt that a verson of this lamp carries Miller's 1892 patented wick raising devise (above) however there exists a number of styles of fount carrying different embossing and burners. Of those I have seen two are of most interest. One (pic 1) is identical to Miller's 1892 'high-shouldered' fount (see pic 2) and clearly has a Miller burner, filler cap and gallery. I have no doubt what-so-ever that these parts are original to this fount. While the flame spreader is also typically Miller, it does not carry a logo (unlike typical Miller spreaders). The embossed 'The Meteor Lamp Made in the USA' lettering is identical in typeface and style to that on all 'Miller' lamps and is found just under the collar. Interestingly the burner is screw thread. Yet another 'Meteor' fount (pic 3) is entirely different - although the wick raiser might appear similar to Miller's June 1892 patent it is a different devise. The embossed pattern, and filler cap are unrecognisable and cannot be considered work by the Miller Company. The burner likewise with only the prongs having a Miller influence. Research by others (ref. WC (Bill) Coutier, E. Hindsdale et. al) assists. The Meteor Fount (pic 3) was made by the Meriden Bronze Company from around 1895, an independent company who ceased business around 1900. It appears Miller obtained the 'Meteor' name at that time. Then concentrating on manufacturing his c. 1895 patent Juno lamps he adapted the unused tooling from his earlier 'high shouldered' fount - altered it to incorporate the screw threaded collar introduced in 1895 and changed the brand to 'Meteor' . The brand is the only commonality with no interchangeable parts from the earlier 'Meteor' to the Miller 'Meteor'. 'The Non Explosive Lamp' – c. 1900? Again, basically the same as the c. 1895 patened 'Juno lamp' but embossed 'The Non Explosive Lamp'. This lamp seems to be an attempt to ally fears of keorsene lamps 'exploding' with the confusion of kerosene and the new 'petrol' or 'gasoline' which was becoming commonplace with the increasing popularity of that new invention 'the motor carriage'. Only known in the #2 size as a table lamp. 'The Miller Mill Lamp' – c. ???? Again, basically the same as the c. 1895 patened 'Juno lamp' but embossed 'The Miller Mill Lamp Made in the USA' . This lamp is of a completely different design and concept. A very large capacity fount, fitted with the No. 3 'Mammoth' filler cap. 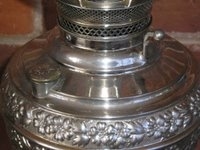 This lamp has no base or stem, but three small cast feet attached to the underside of the fount.
' The Gaskell Lamp' seems just a re-branding of the standard No. 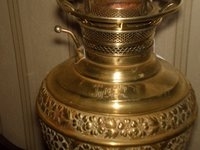 2 embossed Juno Lamp. Typically it is found with a pressed brass base similar to that usually found on New Juno and Vestal lamps. Inscribed around the collar 'The Gaskell Lamp' it is of note that the inscription 'Made in the USA' has not been included which does indicate that this lamp was intended for a particular market or wholesaler and thus making use of the Juno tooling when the factory would have been concentrating on making Vestal lamps. 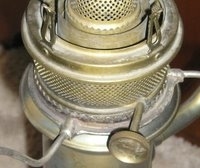 Finally Miller was able to incorporate into the burner a thumbwheel similar to that of the flat wick lamp. The carriage was also re-designed so the wick fitted inside it, so that it was the wick next to the central draught tube, not the carriage. With this patent, when removing the burner, the carriage and the wick comes with it. The thumbwheel is typically embossed with 'E. 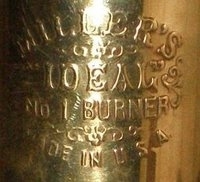 Miller & Co.' and was made in all three main sizes (#0, #1, #2). Embossing varies from 'The New Vestal Made in the USA' to incorporating the size - thus a Vestal #0 lamp is embossed 'The O-Vestal Lamp' . Typically the wick wheel on the zero sized lamps is not embossed. 'The New Vestal' does not appear to have ever been made with a bayonet fitting burner - only screw thread. 'Ideal?' patent – c. 1916-18? Following Miller's 'New Vestal' patent, an adjustment was made, simplifying how the thumb-wheel controlled the wick carriage, necessitating the moving of the thumbwheel from perpendicular to the burner, to the side. The carriage was also completely re-designed, but remained outside the wick, like the 'New Vestal' patent. Although definately a Miller design, the vast majority of lamps with this patent are un-branded, in that there is neither a brand name, nor Miller's company Logo on the lamp (apart from on the flame spreader). I have found this style of burner on both table lamps and student lamps. The table lamps are inscribed as ''Millers Vestal'. A double No. 1 student lamp does have embossing 'Miller's Ideal No. 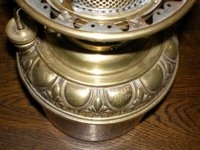 1 Student Lamp' and is in brass, table lamps are usually nickel-plated and are found both embossed and plain. I have not seen this patent in the #0 size but exists in #1 and #2. 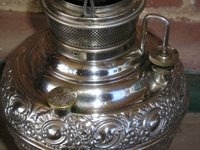 In student lamps the thumbwheel is often separate from the burner, being incorporated into the wick flask. I estimate the date of this design to be 1916 -1918 as it does not appear in a 1915 catologue of Edward Miller & Co. The thumbwheel is known both embossed (similar to the 'New Vestal' thumbwheel) and plain, as photographed.